Adam and Eve disobey God, not because their lives aren’t all good and full of blessings, but because the serpent plants a seed of doubt in them about God’s love for them. After growing impatient waiting to conceive Abraham’s child as God had promised, Sarah takes matters into her own hands and has Abraham lie with her maidservant Hagar so that Abraham may have the child God promised Him. The Israelites create a golden calf and worship it despite the great miracles God performed for them simply because Moses took “too long” to return from his meeting with God at Mt. Sinai. In Luke chapter 11, the Pharisees accuse Jesus of driving out demons with the help of Satan himself even after witnessing Jesus feed thousands with just five loaves of bread and two fish, bringing back to life the widow’s son, and healing many others. Satan, whom Jesus calls the “Father of Lies” (John 8:44) appeals to our pride and attachment to earthly vices to convince us that he is the one who is trustworthy, not God. After all, God doesn’t give us what we want when we snap our fingers so God must be lying when He tells us that He loves us. God even lets us suffer – what kind of love is that?! We are foolish to fall for these lies!!! 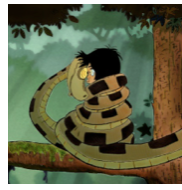 This is reminiscent of the scene from the Disney animated film, the Jungle Book, where Kaa, the serpent, hypnotizes the young boy Mowgli while singing: “Trust in me, just in me, shut your eyes, trust in me.” Kaa obviously doesn’t care about the well-being of the boy – he just wants to gain control of him to eat him. “Your opponent the devil is prowling around like a roaring lion looking for someone to devour” from 1 Peter 5:8 comes to mind as well.